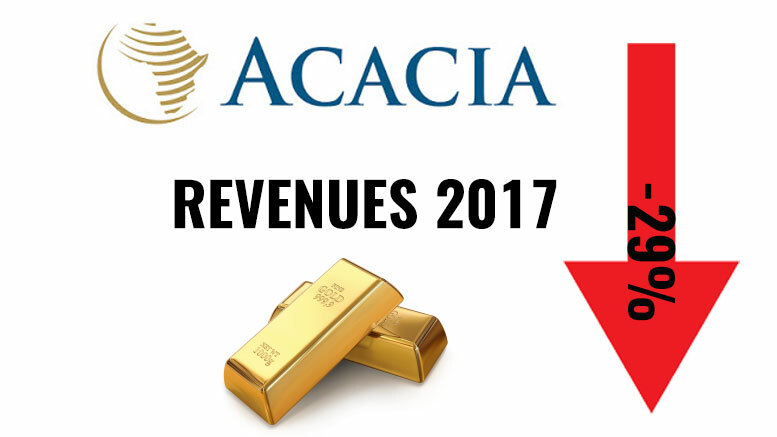 Tanzanian largest gold producer Acacia Mining (LSE: ACA) released its 2017 Preliminary Results showing net losses of USD 707.394 million as opposed to net earnings of USD 94.944 million in 2016. During the same period revenues dropped by -29% reaching USD 751.515 million versus USD 1,053.532 million in 2016. Peter Geleta, Interim CEO of Acacia explained that the company was impacted by events beyond its control, referring to the ongoing ban on the export of gold/copper concentrate that resulted in the company being unable to export and sell 185,800 ounces of produced gold which led to a substantial cash outflow. Unsold concentrate also includes 12.1 million pounds of copper and 158,900 ounces of silver, currently stockpiled in Tanzania. In March 2017, the Tanzanian Ministry of Energy and Minerals announced a ban on the export of metallic mineral concentrates. During Q2 2017, two Presidential Committees announced findings post investigations into mineral content and historic exports of gold/copper concentrates, accusing Acacia of undermining its values. The company made a number of observations that discredit the findings and refuted the accusations. In July 2017, Acacia received adjusted tax assessments totaling USD 190 billion for alleged unpaid taxes and penalties, and in the same month commenced international arbitration. In October 2017, Barrick Gold, Acacia’s largest stakeholder, announced that it has agreed on a framework for the resolution of the disputes with the Government of Tanzania. However, no detailed proposal has yet been presented and Barrick suggests a final proposal in H1 2018. Any settlement will need Acacia’s approval.